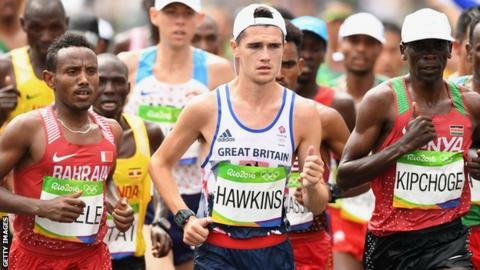 Scottish marathon runner Callum Hawkins has become the first athlete selected for the British team at the London 2017 IAAF World Championships. Hawkins, 24, finished ninth in the Rio Olympic final in August in only his third attempt at the distance. "We are delighted to confirm Callum's selection," British Athletics performance director Neil Black said. "We can already see his talent, finishing eighth at the London Marathon then a brilliant ninth place in Rio." In October, Hawkins became the first Scot to win the Great Scottish Run since 1983, setting a Scottish half-marathon record in the process with his time of 60 minutes 22 seconds.